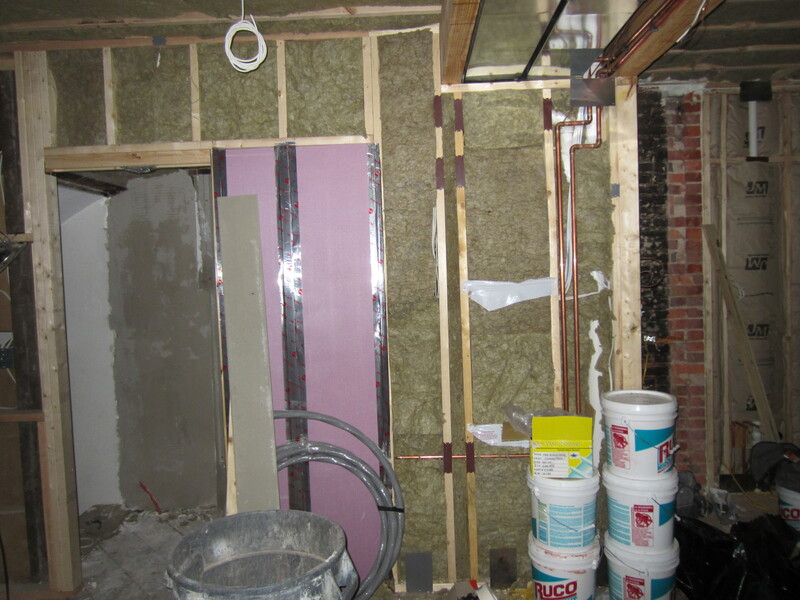 The final stage of insulation to go in was cellulose between interior floors and walls. 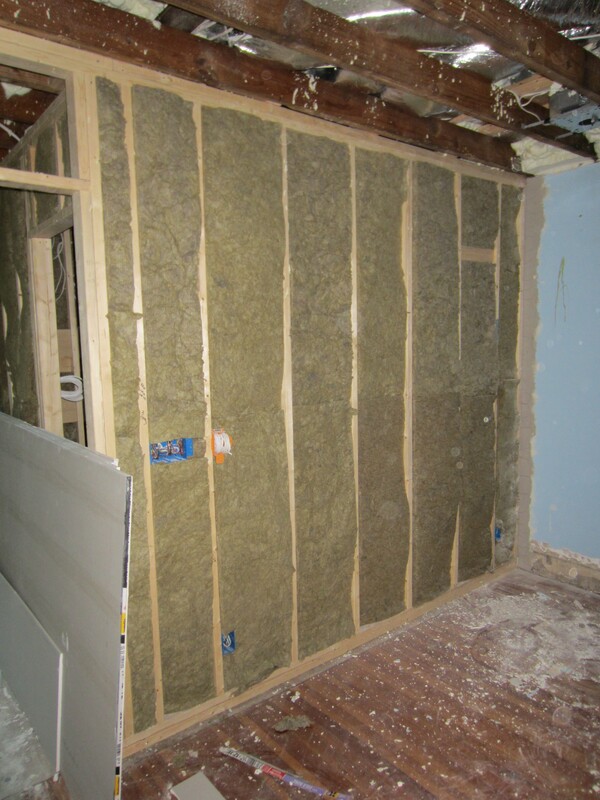 The purpose of this insulation is different than in the previous two posts. 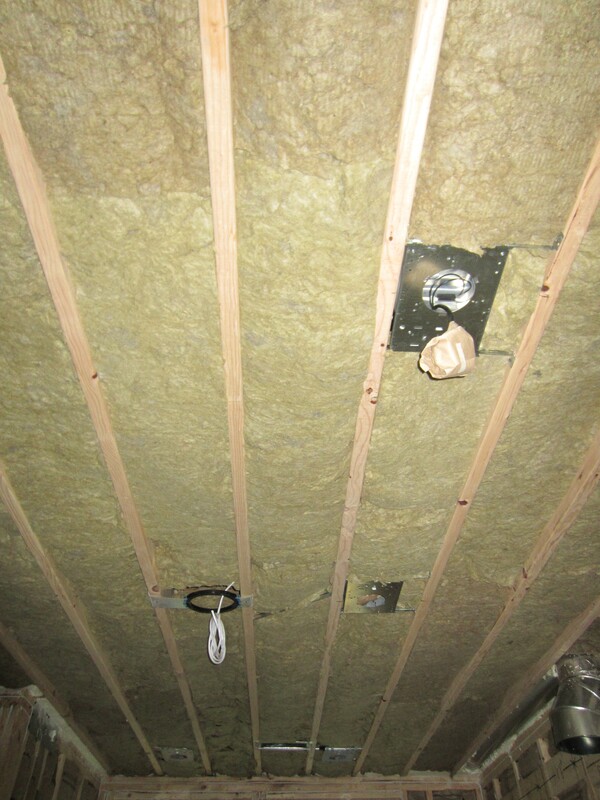 This time we’re insulating for sound between floors and rooms. Anyone who’s stayed at our house becomes quickly aware of the sonic transparency of the space. First floor? Second floor? Bedroom? Bathroom? It doesn’t really matter where you are – it’s like everyone’s in the same room together. The complete absence of a subfloor on the second floor was the primary culprit, and this, combined with ill-fitting passage doors, likely caused most of the problem. 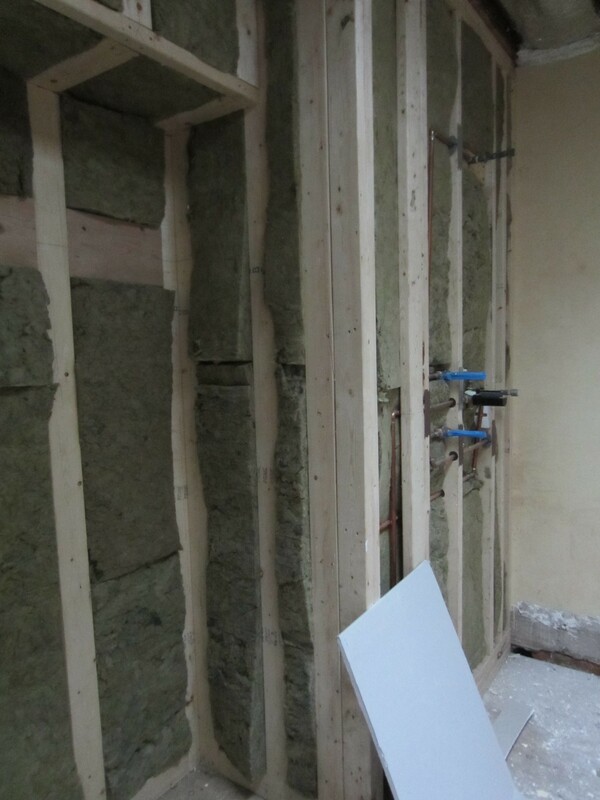 But, as long as we were insulating before drywall is put up, we figured we may as well do everything we can to attenuate sound, as well. We’re also covering the exact opposite goal in this post – sound amplification. 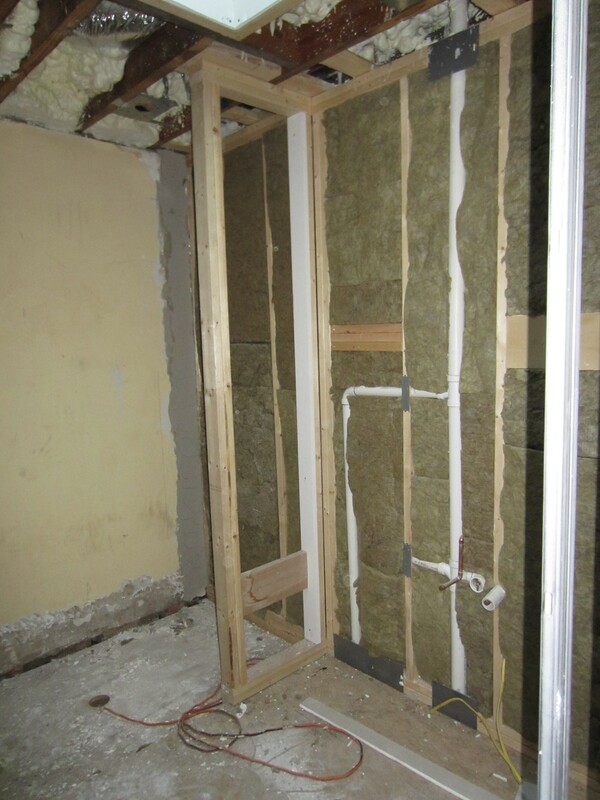 As you’ll see in the photos below, one final infrastructure element that was never covered in the recent posts on this topic went in immediately before insulation began. This was the AV infrastructure, including speakers in the ceilings. To make the schedule and install before insulation, our AV consultants sent a double crew over on a Monday morning to string Cat 5e network cables and speaker wires all over the house. 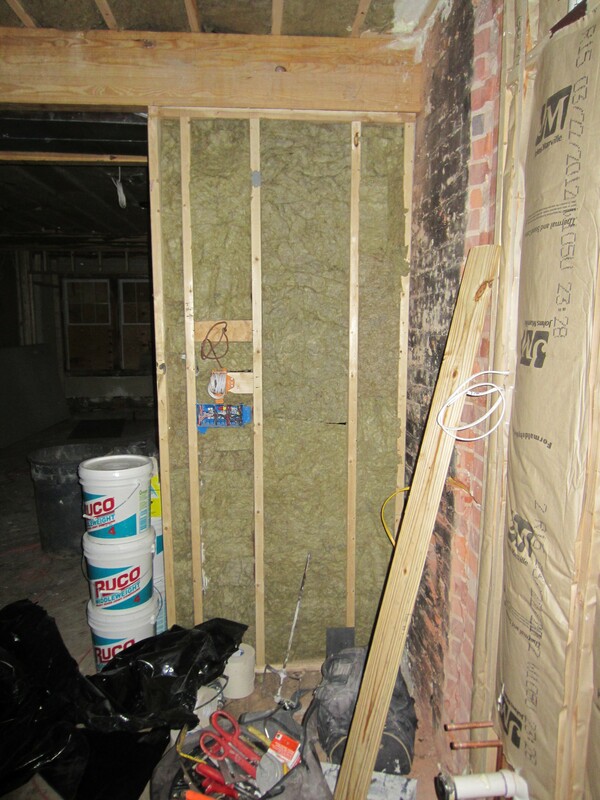 Insulation began promptly on Tuesday morning. 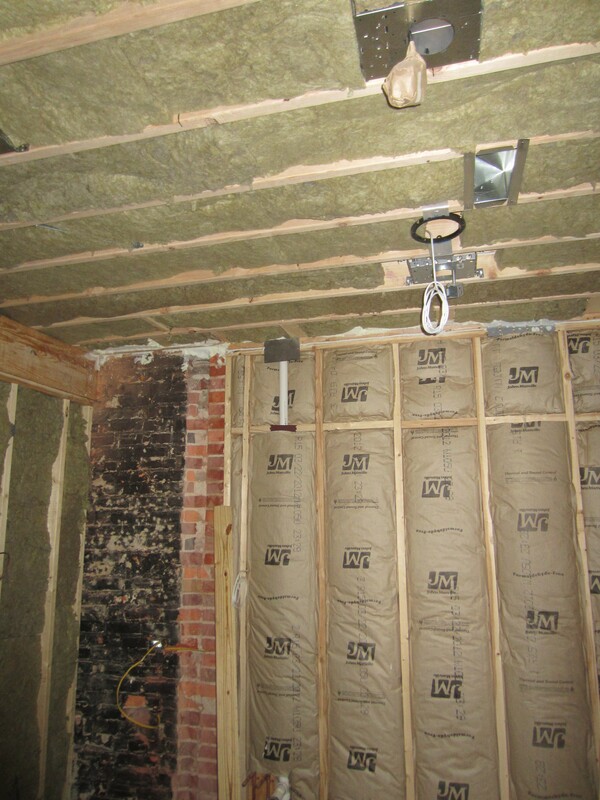 The sound insulation Tuesday evening was a sea of moss green flowing across the first floor ceiling. Here’s a view north, from the kitchen. In addition to the recessed light fixtures, you also can see one of the two, 4″-diameter kitchen speaker placements in the center. The powder room also got the full treatment, for obvious reasons. No longer fear chili night at Wolfe Street! In addition to the insulation, this picture also shows the center and left speaker locations for the surround system. It’s a 5.1 system, so three of the 6″-diameter speakers are in the bay where that center speaker is located and the left and right satellite speakers are on the back wall. The subwoofer will be located inside a cabinet under the dining/kitchen peninsula. The photo above also shows the TV niche, which has been framed out. The AV guys at this point have run network cable and HDMI cables to this location, which is what’s hanging out there. 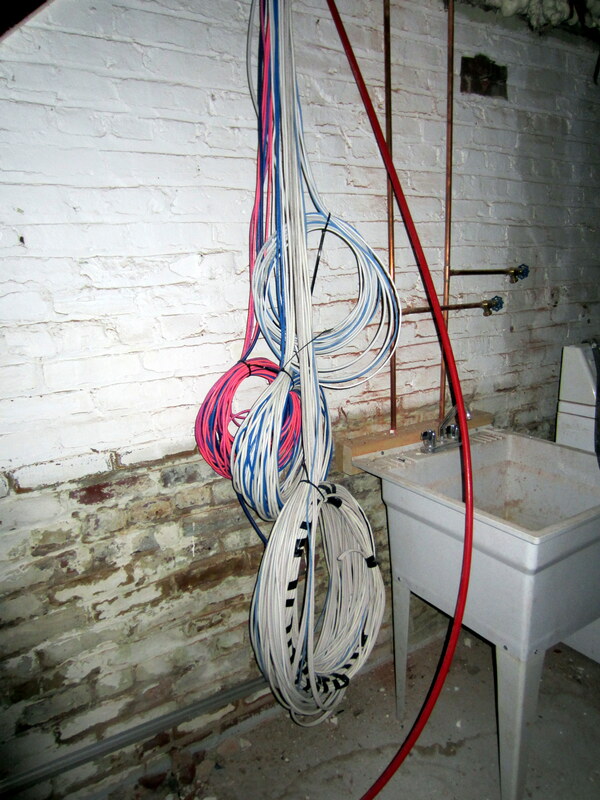 All of the network and audio cables in the house (kitchen, living room, and the two bedrooms and bathrooms upstairs) make “home runs” down to an equipment hub in the basement. 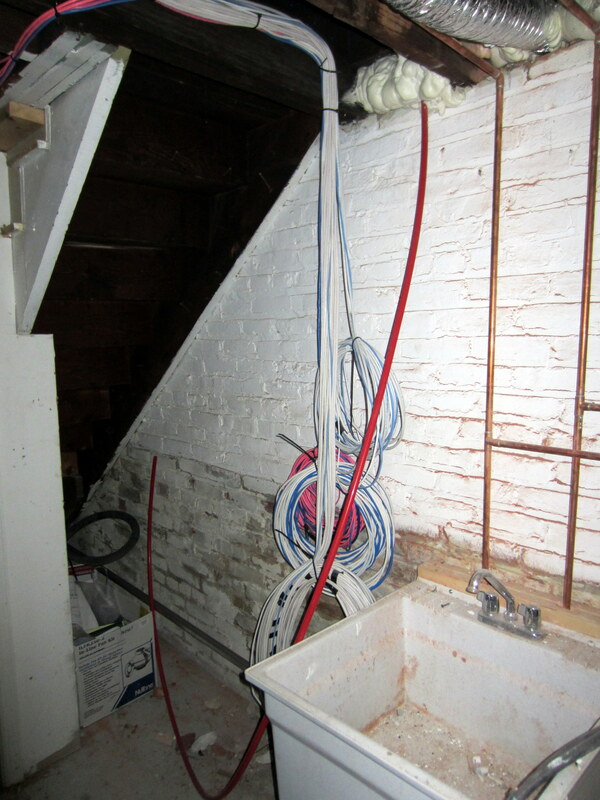 We’ll have shelving here, and the utility sink is being moved south. Heres’s another view of the coils of cable awaiting connection much later in the project. 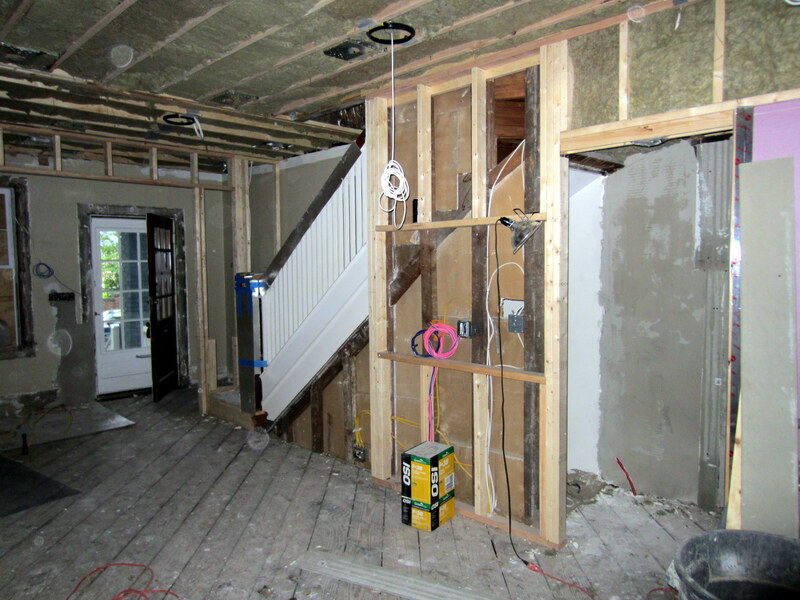 This is what the wall between the guest bedroom and guest bathroom looks like before drywall is installed. You craving burritos while staying at Wolfe Street? Interested in more cabbage than corned beef when coming to stay for the annual St. Patrick’s day party? No problem; go crazy! It looks like you’ve got enough cable to circle the globe 3 times over. Or are you providing disaster recover operations for Reagan National? Oddly, some of the cables came second hand from Spokes, down the street. They apparently were previously routed above the handlebars on a nice carbon-fiber Specialized Rubaix . . .